KIEV, Ukraine -- As demonstrators in ski masks scuffled with the police here on Tuesday evening, opposition leaders accused the government of provoking the very violence it has been condemning in an effort to discredit and possibly split the protest movement. 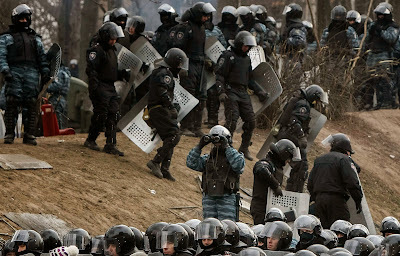 Police officers stood guard during a rally held by protesters in Kiev on Tuesday. “The government tried to marginalize the protest, hoping that after 60 days in the cold people would become tired and leave, and only a different contingent would remain, only bums, but this did not work,” said Yuri Syrotyuk, a deputy head of the nationalist Svoboda party and a member of Parliament. “The government then decided to provoke a conflict, so some radical element would respond,” he added. Opposition leaders say the government of President Viktor F. Yanukovich has also rebuffed all offers of negotiations, adding fuel to a volatile situation. “Few days are left, or maybe even hours, when solving the political process is possible through negotiations,” said Arseniy Yatsenyuk, a leader of the opposition Fatherland Party. Russia’s foreign minister, Sergey V. Lavrov, blamed politicians from the European Union and the United States for encouraging the fighting over the past three days. “It seems someone is interested in this chaos,” Mr. Lavrov said Tuesday at a news conference in Moscow. He noted that American diplomats had said in December at a meeting of the Organization for Security and Cooperation in Europe that the Ukrainian government should heed the opinion of the population and seek greater integration with Europe or risk instability. “What was this, prophecy or a prediction?” he said. The European Union issued no official response to Mr. Lavrov, but its officials say it has never condoned or encouraged violence, as Mr. Lavrov seemed to suggest it had done by having an official mingle with the protesters when they first turned out two months ago. Protest leaders said the authorities seemed to be giving the more radical protesters free rein while going out of their way to frighten more moderate ones, particularly with the threatening text messages sent on Tuesday. The phrasing of the message, about participating in a “mass disturbance,” echoed language in a new law making it a crime to participate in a protest deemed violent. The law took effect on Tuesday. And protesters were concerned that the government seemed to be using cutting-edge technology from the advertising industry to pinpoint people for political profiling. Three cellphone companies in Ukraine — Kyivstar, MTS and Life — denied that they had provided the location data to the government or had sent the text messages, the newspaper Ukrainskaya Pravda reported. Kyivstar suggested that it was instead the work of a “pirate” cellphone tower set up in the area. The messages appeared to have little effect. Three hours after they were sent, riot police officers pushed past barricades of burned buses at that site and were met by a crowd of protesters in ski masks and bicycle helmets, carrying sticks and ready to fight. The police fired plastic bullets and threw stun grenades. They pressed as far as a cobblestone-throwing catapult built by protesters the day before and dismantled it before retreating. The opposition leaders who are members of parliamentary factions face a difficult choice over whether to embrace or denounce the more radical groups as the demonstrations grow more violent. So far, the politicians have condemned those fighting with the police as not representing the aspirations of the larger number of peaceful protesters who have gathered in Independence Square since November in support of closer economic integration with the European Union. Some of those fighting the police, carrying baseball bats and throwing gasoline bombs say they are supporters of the European free-trade agreement whose rejection by Mr. Yanukovich set off the protests. But other groups have also appeared in Kiev, adding to the sense of chaos. Young men carrying sticks wandered side streets near the central square threatening to beat protesters who walked alone. One group shattered a shop window. The opposition leaders have said they believe that these people are soccer hooligans and unemployed men bused into Kiev by the government to provide a proxy force to intimidate protesters and darken the image of the movement by highlighting the violence. “Disorders should not be allowed to happen,” Vitali Klitschko, a former boxing champion and the leader of the political party Ukrainian Democratic Alliance for Reform, wrote on Twitter. Early Tuesday, opposition activists detained about a dozen of these rival young men and marched them to one of several buildings occupied by protesters, where several admitted in videotaped conversations that they had been promised 200 hryvnia, or about $25, to cause trouble. But they were not able to explain clearly who had hired them. A civic activist who has been prominent in the movement, Ihor Lutsenko, was missing on Tuesday after men forced him into a car in the parking lot of a hospital, according to a Facebook post by his wife. The protests, which peaked in December, had seemed to be fading, but were re-energized by opposition to the new laws against public assembly. Peace and Unity of Ukraine must be a priority for all people of Ukraine. Negotiations between the government and opposition are must begging as soon as possible. Perhaps during negotiations parties could set up a specific time frame for the signing AA agreement. Such schedule may include list of industries that must be modernized, schedule of modernization and total percentage of modernization of Ukraine at which AA could be signed (80% or so). When set target is achieved the government must sign the AA. This negotiated terms and time frame should be consulted with EU and agreed upon, to avoid any delays.